Distracted driving has long been a source of consternation for first responders, who arrive at the scene of accidents due to cell phone use on a regular basis across the country. But finally, there is an intervention that just may make a difference: driving mode applications on cell phones. Even though many people claim to be experts at multitasking, the fact of the matter is that driving a two-ton vehicle really does require a driver’s full attention. After all, most people wouldn’t think of texting at the same time they are negotiating a critical business deal, or in the middle of solving a complex math calculation. Why would operating a motor vehicle require any less attention? The truth is, there is no safe way to drive and use a cell phone at the same time. If a distracted driver causes you serious injury, a local personal injury attorney may be able to help. 58 percent of drivers say they talk on the phone while driving. Clearly, distracted driving related to cell phone use is a serious problem. 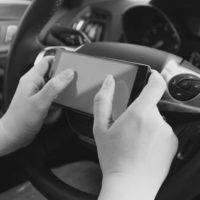 Although over 90 percent of drivers support a ban on texting and driving, and nearly three out of four drivers support a ban on the use of hand-held devices while driving, the problem continues to escalate. Ergo, creators of cell phones have devised a solution that just might make a dent in the problem. What is driving mode? It’s a new option on cell phones that drivers may choose to enable while in a moving car. Instead of incoming messages beeping and singing to get your attention, your screen will remain blank and silent. An auto reply message notification will be sent alerting your friends that you are driving at the moment and will contact them later. Cell phones of all varieties are able to use driving mode when connected to bluetooth. The phones sense when you are driving and switch into do not disturb mode automatically, or with the touch of a button. If you’re a passenger in a vehicle, you can let your phone know and messages will come through normally. At Barbas, Nunez, Sanders, Butler & Hovsepian, we hope all drivers make the choice to drive without distractions. In the event a distracted driver causes a serious accident that results in severe injuries for you or a loved one, our knowledgeable team will work to ensure justice for you. Contact us today in Tampa for a free, personalized consultation.